George Mason Basketball: Are the Patriots coming together? George Mason is on a three game winning streak in which their average margin of victory over UNCW, Towson, and JMU has been about 24 points. The Patriots are starting to resemble last years squad more and more each game; they are playing great defense and are not just relying on one or two guys to score points each night. Their scoring defense is tops in the CAA, last season the Patriots were ranked in the top 10 in the nation in this category at certain points in the season. Larranaga finally seems to have his patented scramble defense firing on all cylinders, steals are up, and opponents look flustered a lot more on offense then they did earlier this season. Another thing to note is that the Patriots have been shooting better, especially from three-point range. John Vaughan was able to get out of his slump and sink 4 threes on his way to 16 points against JMU. The combination of a home loss to William and Mary and a successful new starting lineup might have really kicked things into gear for the Patriots. Jordan Carter and Dre Smith are starting to show that they can make opposing teams pay if they double Thomas and leave them open. Carter has been very impressive as of late, shooting the ball well and coming up with steals that translate into fast breaks. Chris Fleming continues to show promise but suffered a bad sprain early in the JMU game and when he will return next is questionable. I really don't think Fleming can keep himself in the starting lineup, but for right now hes playing smarter than Urbina and Birdsong and thats enough to stay in Larranaga's good graces as the team keeps winning. Can Mason keep this up? A three game winning streak is great but some of the luster is lost in the fact that the Patriots still haven't beaten a top opponent in the CAA yet. Drexel, ODU, Hofstra, and VCU all look great so far and Mason has already lost to two of these teams. But they did not play like they have been this past week in those losses. 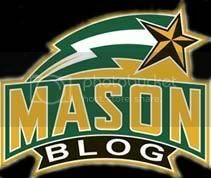 The good thing for Mason is that they a lot of important CAA home games left, which always plays into their favor. That being said Mason will still have to pull off some road victories to climb to the top of the conference which is starting to look very competitive with Hofstra and Drexel both losing recently. Whats wrong with the Patriots?